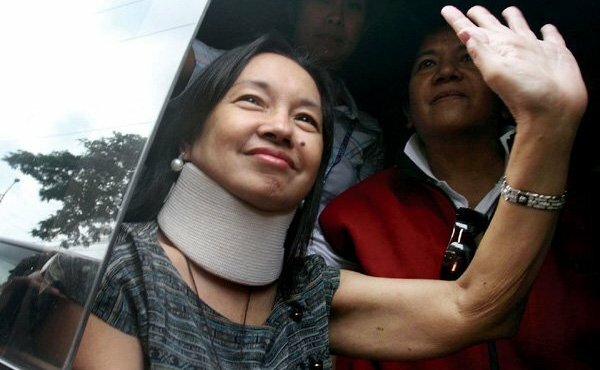 MANILA, Philippines - On Tuesday, July 19, the Supreme Court acquitted former Philippine President and Pampanga Rep. Gloria Macapagal-Arroyo over her alleged misuse of intelligence funds for the Philippine Charity Sweepstakes Office (PCSO). In a press conference, SC spokesperson Theodore Te said that the high court dismissed the plunder case against the 69-year-old lawmaker for lack of evidence. The Supreme Court also set the motion for her immediate release from the Veterans Memorial Medical Center, where she has been in hospital arrest since October 2012. Atty. Raul Lambino, Arroyo’s lawyer, said he got information past noon Tuesday that high court justices voted 11-4 favoring the former president. Among those who voted for the dismissal of case against Arroyo are Justices Presbitero Velasco Jr, Teresita de Castro, Arturo Brion, Diosdado Peralta, Lucas Bersamin, Mariano del Castillo, Jose Perez, Jose Mendoza, Bienvenido Reyes, Estela Perlas-Bernabe and Francis Jardeleza. Meanwhile, Chief Justice Maria Lourdes Sereno, Senior Justice Antonio Carpio, Justices Marvic Leonen and Alfredo Caguioa voted against the dismissal of the plunder case. The plunder case against Arroyo and several others originated from the charges filed by the Office of the Ombudsman for the supposed diversion of P366 million in the PCSO's intelligence funds for personal gain between 2008 and 2010. This was investigated by the Senate blue ribbon committee in 2011.